We boarded a bus that drove us from the apron to a “terminal” for arriving charter passengers. Our bags were searched by soldiers and returned to us. We were met there by a lanky Turk with a shaven head named Ufuk (pronounced oofOOK). Ufuk drove us from the terminal (really just a collection of Hesco Barriers and a shed) to our camp. 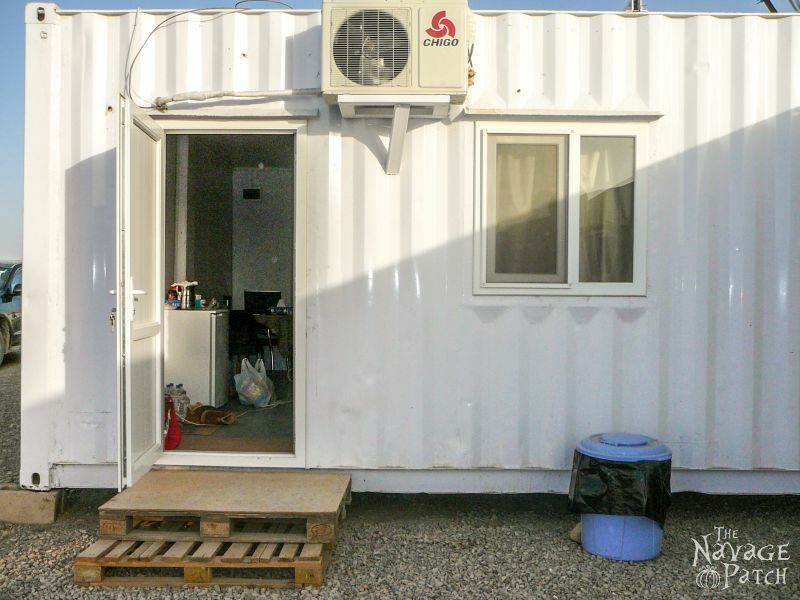 The military base was called Camp Bastion, but our company (Metag – a Turkish construction company) had its own camp within the larger military camp consisting of living containers, office containers and a mess hall. Our camp was referred to in military lingo as an “LSA.” Initially I assumed that the letters stood for “Living and Socializing Area,” but remember this is the military we are talking about, so of course the real meaning is far more clinical and uninspiring. In fact, “LSA” stands for “Life Support Area.” Technically correct, but yeesh, loosen up a little, will ya? Our long journey complete, we said hello to our boss and co-workers, then crawled into our tiny (but temporary) accommodation (a small shipping container modified for living) to take a much-needed rest. This was our initial accommodation. A small converted shipping container with two twin beds, two dressers, and a small bathroom with a shower, toilet and sink. I’m wearing my Camp Bastion ID around my neck. I also have my passport. I carried that everywhere and never let it out of my sight. 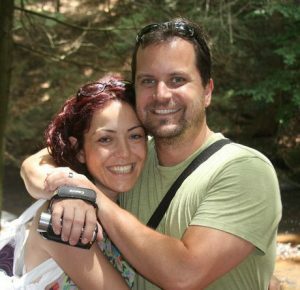 This picture was taken on my 38th birthday, 9/19/10. We had been in Afghanistan almost two weeks. Those first few weeks were a wondrous time. The days were punishing, with daytime temperatures approaching 120° Fahrenheit. In early September the “winds of 120 days” (seasonal winds active from May to September), would tear through the region almost daily. These winds brought sandstorms and zero-visibility conditions. 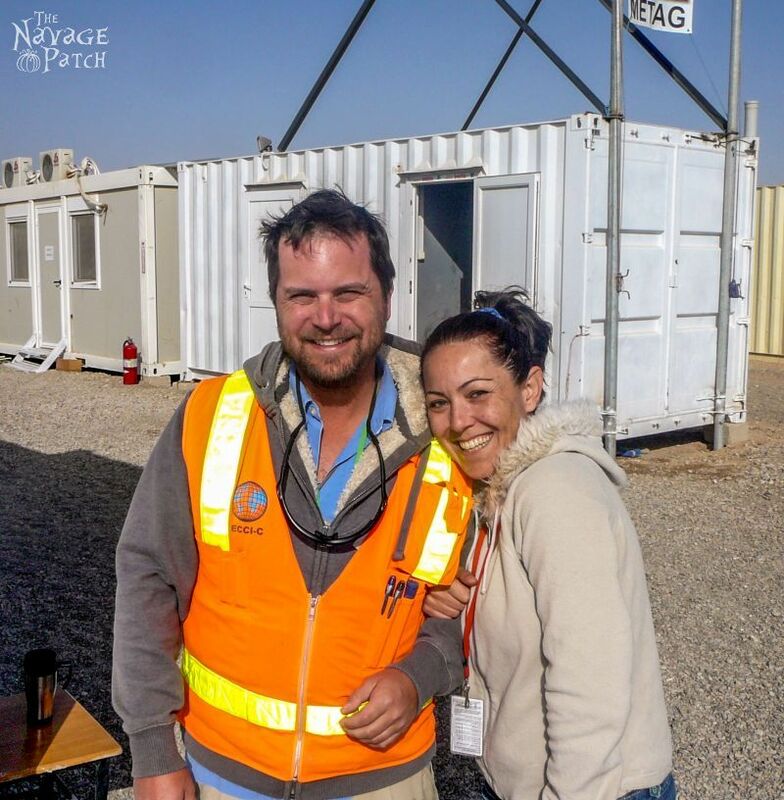 Sometimes I’d be out working with one or two Afghan helpers, stringing rope along the perimeter of our work zones, and we would find ourselves cut off from the rest of the camp, isolated from the world. In those times, I felt like we were the only three people on the planet. Everything was gone. Sand battered my goggles, the roar of the wind filled my ears, dust crept into my face mask and into my mouth and nostrils. There was nothing but the roar of blasting sand, no division between earth and sky. After some hours, the winds would abate, and the sun would return. 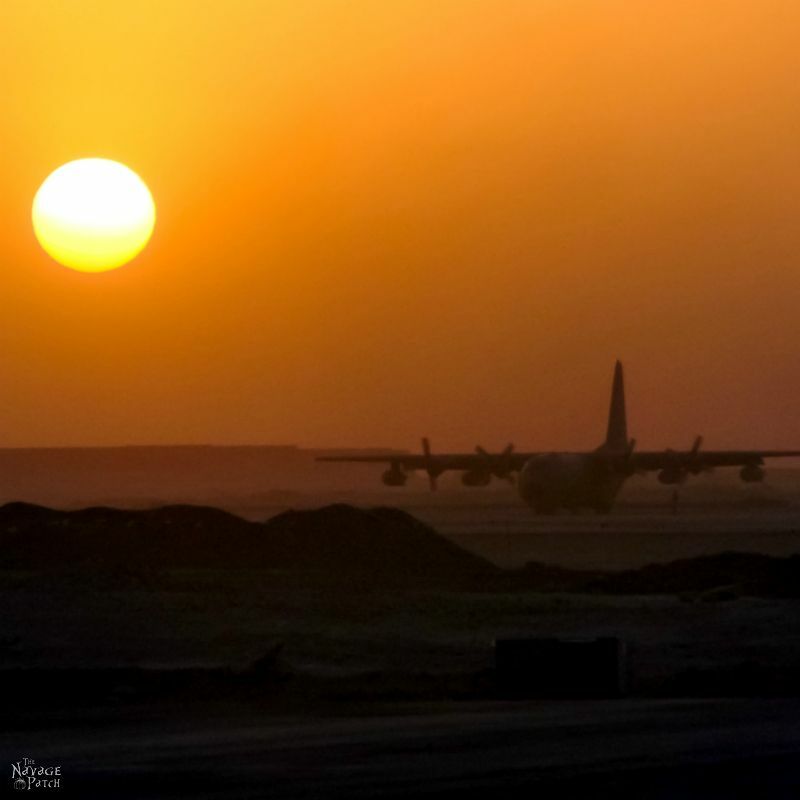 Buildings, aircraft and people would be revealed behind the settling curtain of dust. I would return to camp, windburned and brown. The showers I took those evenings were the best of my life. If the days were hot and dusty, the nights were usually cool and calm. Handan and I enjoyed sitting on our stoop (the one made of shipping pallets, pictured above) in the evenings playing Scrabble by the light of our headlamps. I would wear my flipflops, relishing the feel of free toes after a day of cramped boots. One night as we sat together with a heated contest of Scrabble laid before us, a movement caught my eye in the darkness. The area was pitch black, save for the light that spilled from our doorway and our headlamps. Something had caught that light and reflected it back. I went to investigate, sweeping my headlamp back and forth over the gravel. What I found unnerved me. There are very few creatures that give me the creeps and make my flesh crawl. This was one of them. The desert may have belonged to humans during the day, but at night, more sinister things reigned. 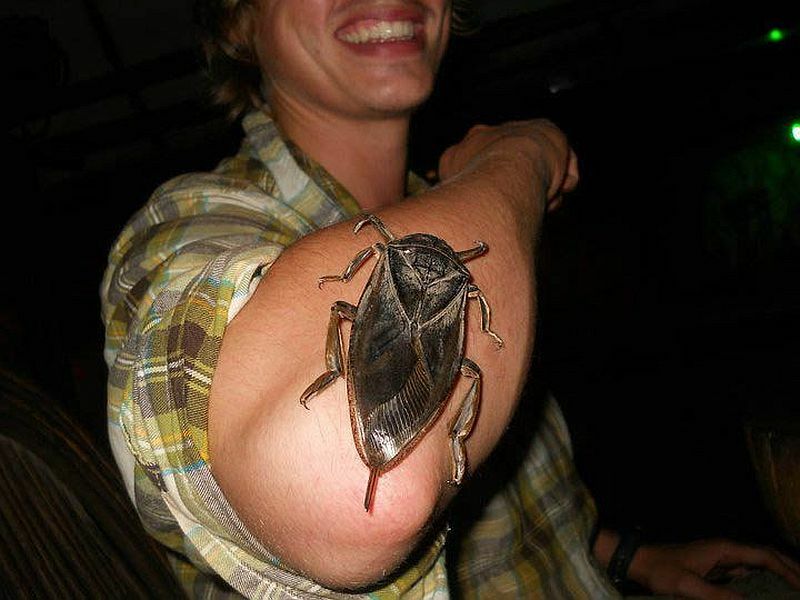 I would later learn that it was a Giant Water Bug, commonly known as a “toe-biter” for the painful bite it delivered. Their bite is poisonous, designed to paralyze and liquefy its prey. They are attracted to light and have another nickname, the “electric light bug,” so our doorway was a welcoming beacon in the darkness. We moved our game inside, and I never again wore sandals at night. At the time we moved to Camp Bastion, it was considered impregnable. 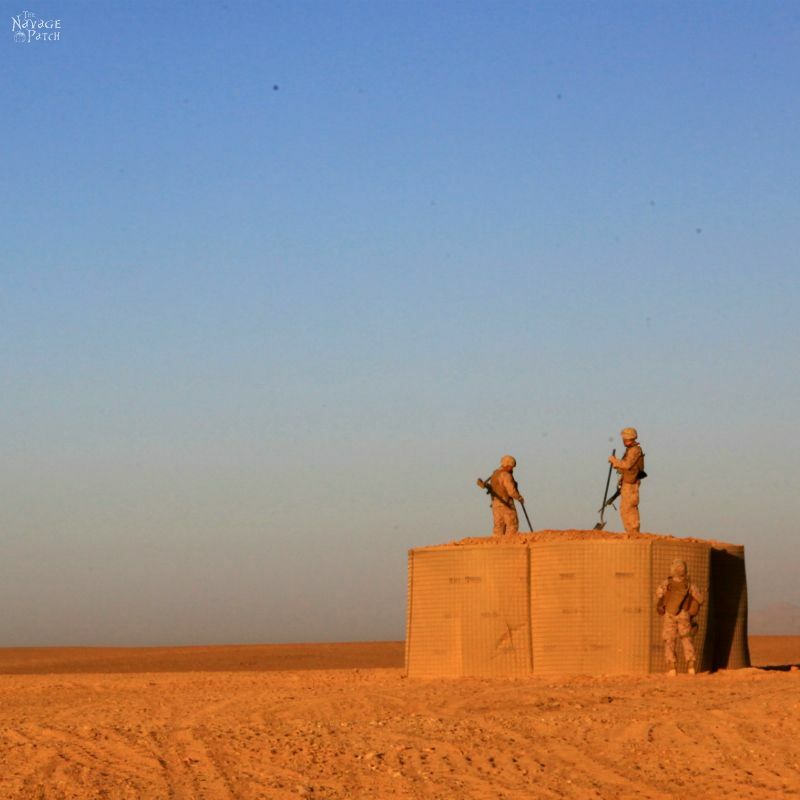 Surrounded on all sides by endless desert and patrolled 24 hours-a-day by troops on the ground and drones in the sky, it was thought that no enemy could ever sneak up on the base in order to mount an attack. Indeed, it was this very argument I used when convincing my parents that Handan and I were not embarking on some half-baked suicide mission by going to work there. Of course, this didn’t stop the insurgents from trying. Several times a week, soldiers would intercept explosives at one of the gates to the base. Since there was always construction going on (hence us being there), there was a never-ending line of dump trucks and supply trucks snaking back from the gate awaiting inspection. When an explosive device was found (or sometimes a whole dump truck full of explosives), the soldiers would take it to a safe area and blow it up. 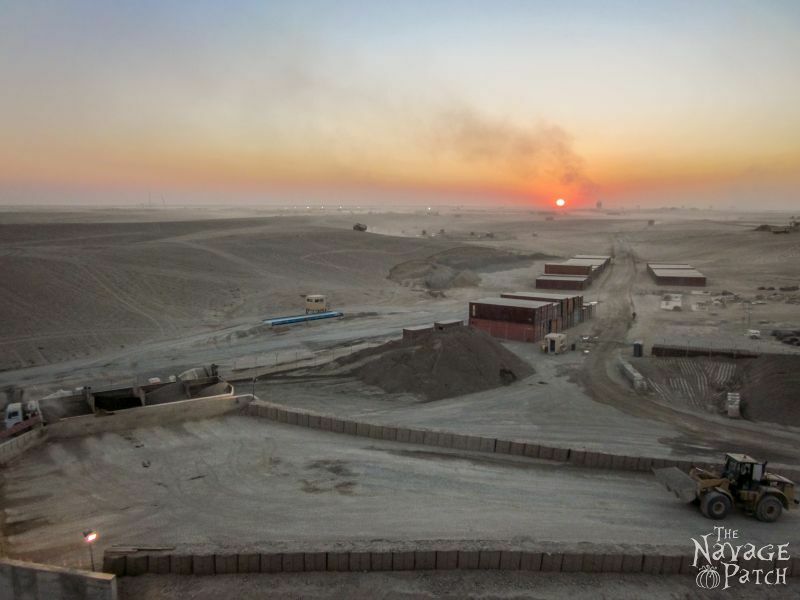 This was known as a “controlled detonation.” Before the soldiers blew this stuff up, they made an announcement on the loudspeaker systems of both Camp Bastion and Camp Leatherneck. But as I mentioned earlier, we were living on the outskirts of the base, and we were far outside the range of the loudspeakers. So instead of a few minutes’ warning before a controlled detonation, we would just get jolted out of our seats or bed or boots by shock waves of varying intensity. The big ones always startled the crap out of me. Here’s a nice little sunset photo with the smoking remains of a controlled detonation in the background. As the crow flies, that detonation area was at least a few miles away. We were on one side of Bastion, and the detonation area was at the far side of Leatherneck. I can’t imagine how loud those booms must have been to the soldiers living in Leatherneck. Controlled detonations weren’t the only things that went BOOM at Bastion. Leatherneck had mobile missile launch capability with the M142 HIMARS (High Mobility Artillery Rocket System). These missiles moved so fast that if you weren’t by chance looking in their direction when they were launched, you wouldn’t be able to see them. By the time you heard them, they’d be out of sight. If you were lucky enough to catch a glimpse, they moved too fast for the eye to track. 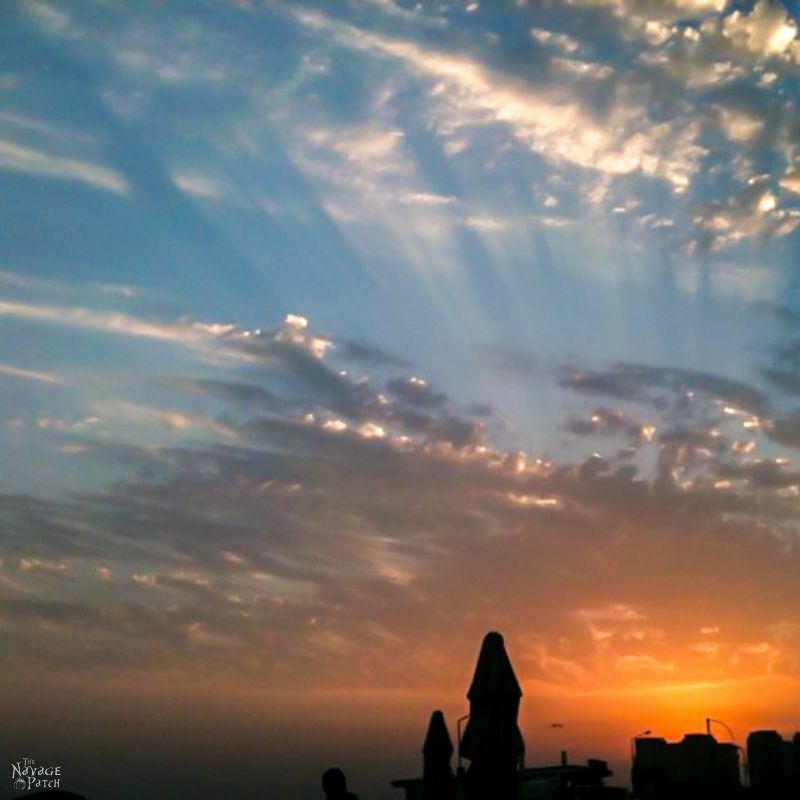 The sound they created was intense, like someone tearing apart the fabric of the sky. Depending on which direction they launched, a sonic boom might follow. I remember one morning, I was walking on some newly-cured concrete, coffee in hand. It was winter, but the sun was bright and strong. Sunlight reflected off the concrete, causing me to squint as I looked to the east. Someone behind me called my name. I turned around, and my body was punched by an invisible hand. Leatherneck had launched a missile probably just before my name was called, and just as I turned around, the sonic boom shock wave hit. The early morning, the cold, the sleep still in my head, the bright sun and then BOOM. I was stunned, and stood there for a few seconds wondering what the hell had just happened. Who needs coffee when you can wake up with a sonic boom body slap? I mentioned before that our living quarters were tiny, but this was only temporary. We were the only civilian married couple living on a military base in our company (in the company’s history) and likely the only civilian married couple living on the entire base and maybe even the only civilian married couple living on any base in Afghanistan. Because of this (and let’s be honest here, because my wife was the big boss’s daughter), we were to have a special accommodation made for us. Normally, someone like Handan or me there alone would merit an entire shipping container to ourselves. But since we were a couple, and since we weren’t keen on sleeping in separate twin beds, we would be getting two shipping containers, joined along the long edge. They basically removed one long wall from two containers and welded them together. 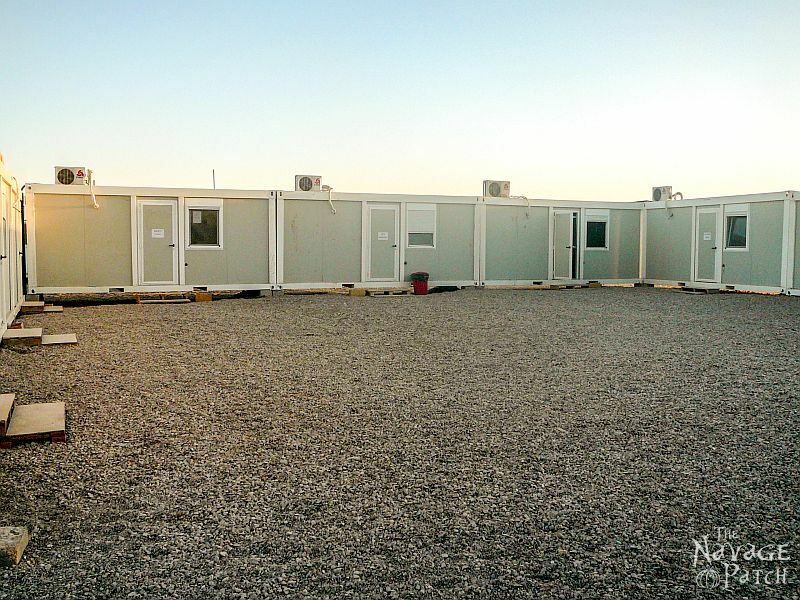 All of the living containers were fitted out with interior walls, electricity, air conditioning/heat, plumbing, a toilet, sink and shower. 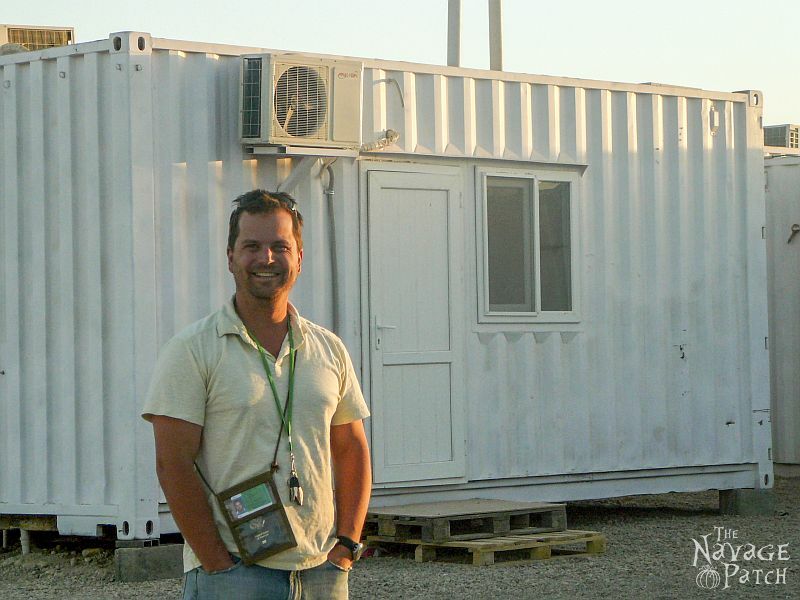 The containers for those in management had a small fridge, a small flat-screen TV and a satellite dish on the roof. We were lucky. Our accommodation was so spacious, we even had room for a table and chairs as well as a queen-size bed. Our double-wide was constructed in Kandahar, a city of 500,000 about 100 miles to the east that is home to another US military base. It needed to travel to us on the back of a large flatbed truck, and it had to travel on roads controlled in large part by the Taliban or other local factions. This was the way of life in Afghanistan, and everyone had to play by the local rules of the road. At any given time, drivers could be pulled over, extorted, harassed, beaten or killed if the Taliban suspected that the cargo was intended to aid American forces or American interests. Our own company lost a Turkish driver shortly before we arrived in Afghanistan. The Taliban pulled him over near the Iranian border as he was making his way towards Bastion hauling a load of rebar. They took his truck, and they took his head. Fortunately, the truck carrying our living quarters only received minor harassment en route to Camp Bastion. The driver arrived unharmed, but our new house took a few bullets. You can see the bullet holes over the window and door and also to the left of the door. It was nothing a little bit of silicone sealant couldn’t fix in a jiffy. Twice as big, same wooden stoop. With our new quarters squared away, we turned our minds back to our jobs. We worked long hours over there, starting around sunrise and carrying on sometimes until dark. We worked a schedule of 13 days on, 1 day off. That’s right, 13 on, 1 off. At first it was tough, but we got used to the idea of constant work. There was very little to do on a military base in the middle of the desert anyway, so work helped pass the time. Handan was the quality control manager. 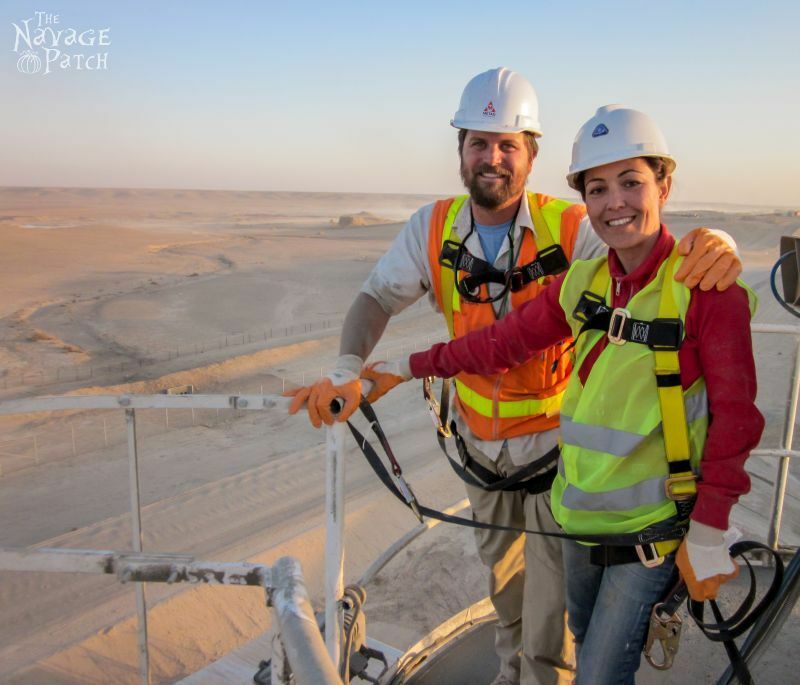 She spent most of her time in an office, but did occasionally head out to the job site. I started as a health and safety officer, then became health and safety manager after two months. Most of my time was spent on the job site. This was our office area. My office was on the left, and Handan’s was the one with the open door. Behind where I was standing taking this picture was the project manager’s office and the tea room. Every Turkish job site has a tea room, and every tea room is staffed by a tea boy. His job is to bring tea or coffee to those working in the offices. Unlike American companies, Turkish companies are required to feed their employees, so every job site will not only have a tea boy, but they will always have a canteen providing meals for the workers. Our tea boy was named Hayrettin, a good-natured kid from a village near Mazar-e-Sharif in the northwest corner of Afghanistan. As Handan explained, the tea boy can be a powerful ally and should always be treated with courtesy and respect. Not only does he provide life-sustaining caffeine, but his eyes and ears are in every office he serves throughout the day. Much can be learned from a chatty tea boy. Handan and me on 10/26/10. The tea room is the open door above Handan’s head. I was out on the far edges of the work site setting up a safety perimeter with meter-long sticks of rebar and rope. The sand underfoot was bone-dry and dusty like talcum powder. Handan had just inspected the site and saw me walking, so she decided to join me. We started walking back towards camp, parallel to an area where a group of about 20 Afghans were busy preparing the site for concrete work. As we walked, Handan spotted a twisted piece of rebar about 3 feet long that curved through the dust before thrusting up in its final foot. Most likely it was part of an older perimeter safety fence, but had been run over by a piece of heavy earth-moving equipment, hence its twisted form. But all Handan saw was a 3-foot snake 5 feet in front of us. Handan is deathly afraid of snakes. It is an irrational fear greater than any I’ve ever witnessed. She grabbed my arm, jumped up in the air and let out the loudest, girliest scream ever heard in Afghanistan. The Afghan workers, easily 50 yards away, stopped in their tracks and turned our way. Every single one of them. They gawked as Handan yapped like wounded toy poodle. I doubled over, laughing. She finally realized what it was, but was still totally freaked out, running away from the rebar snake like a headless chicken trying to escape the chopping block. She still gets pissed if I laugh too much about that story. Love your writing style, your stories are funny and fascinating. Can’t wait for the next chapter. So cool you’re sharing yourselves. Thank you! Part 3 just published, Chellie. Thanks for reading! Greg, your story is fascinating! You should seriously consider a career in writing. I love the pictures you have included but your writing is descriptive enough that I can pictures the events. I love the humour, perhaps a book is on the horizon! Don’t make us wait too long for the next chapters please! To think I found your blog from a DIY site that featured your roll-out drawers. Lol! 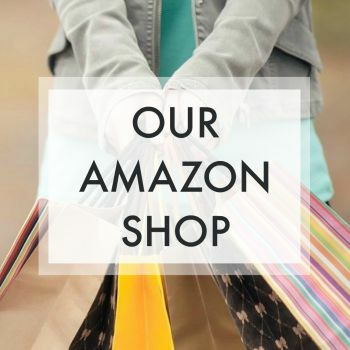 Hi Giselle – thank you for your compliment! Feedback like yours keeps me going! Look for the next chapter later this week. Hi Giselle, I just published part 3. Thank you for reading! Thank you so much, Mary! We are safe and sound in Connecticut. This particular adventure in Afghanistan lasted from September 2010 until September 2011. Check out part 3…I just published it. You and Handan are officially my favorite couple bloggers. You both are amazingly talented. I have been on your Blog many times but only today discovered that there are many installments to your love story. I could not stop reading about your journey and had to pry myself away to go earn a living. Will be back to finish reading the rest of the installments. Greg – you are a gifted story teller! Thank you, Nadine! I’m so happy you found our story! Hey, are you the same Nadine that we often see on Hometalk? 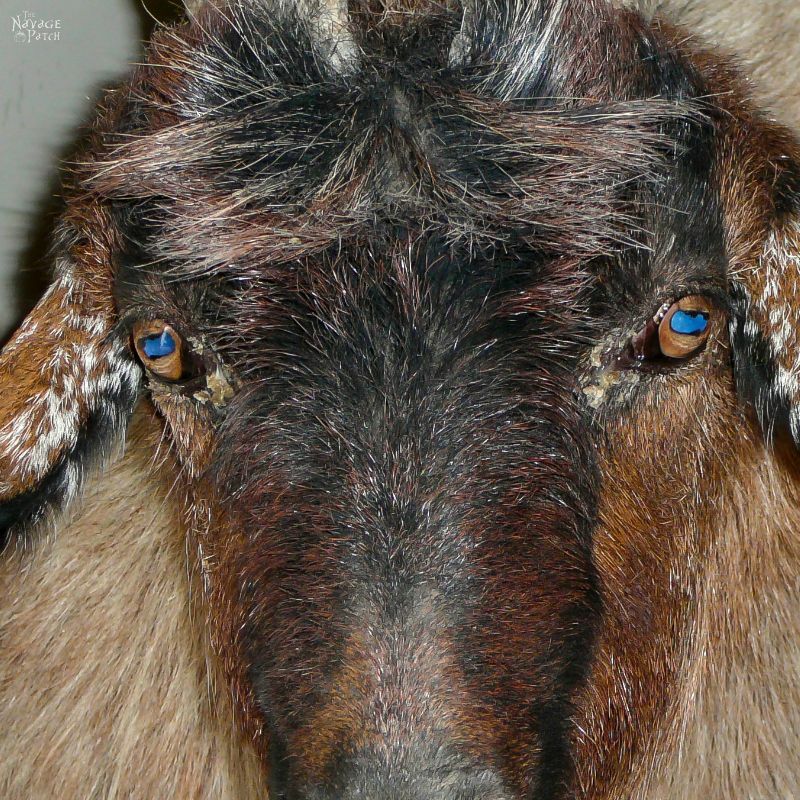 Love your story but can’t get that giant water bug out of my brain….ewe!! You make it sound like Afghan women were always in a burqa. Burqa was mostly unheard of in most areas of Afghanistan, especially in and around Kabul. burqa was forced on women and young girls during the Taliban reign, thanks to the United States. Uzbek family of my niece and nephews fled Afghanistan during the russian invasion. The females never wore burqas and were highly educated. During a wedding of a cousin, the parents did a ” how we met and had you” slide show. The mother was in mini skirts in most photos. Kabul was a beautiful modern city before the Russian invasion and American intervention. Just saying! Hi Sevil, thank you for writing – you make an important point, but nowhere in my post did I say that Afghan women have historically always worn burqas. I’m well aware of how beautiful and liberal and tolerant Afghanistan was before the Soviet intervention, the civil war and the Taliban seizing control in 1996. Those 20 years screwed the whole country to hell. My point is, the young Afghan men who worked with us had likely never seen a woman not in their family (nor in the military) without a burqa, as they would have been babies or children at the time of the Taliban takeover. 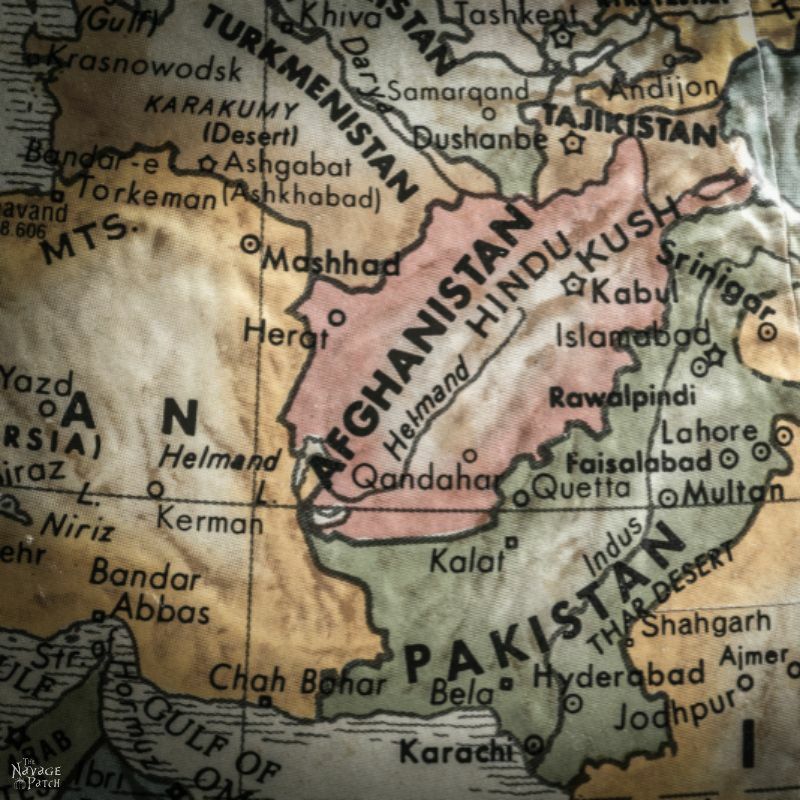 I’m not here to justify nor dispute American involvement in Afghanistan, but by the time we got there, the Russian war, the civil war and the Taliban’s reign of terror had already brutalized the soul of a once-great country. I pray it can regain that glory in my lifetime. I’d like nothing more than to visit Afghanistan once again – this time as a tourist to a nation at peace rather than as a contractor in a war-torn country with an ineffectual government. I think that criticism was unfair, and you explained yourself and the current situation well Greg. The fact is, in many places today women are made to cover, from social pressure to imprisonment. Iran is another place which was once a flourishing society, going through the same thing. It’s so sad, Tracey. I hope things improve in our lifetime.